Home » General » Literary Lift Off! 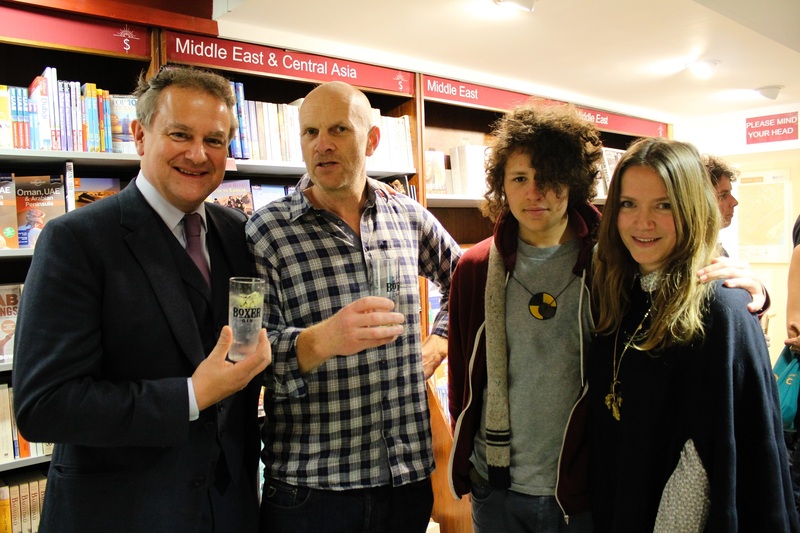 The launch celebrations kicked off in the salubrious surrounds of the world’s oldest travel bookstore, Stanfords in London’s Covent Garden. Eighty of us gathered on the map-covered ground floor and once the business of a brief reading was over we got down to the nitty-gritty of chatting and drinking large quantities of Boxer Gin. Guests included my tukking partner in crime Jo Huxster; Hugh Bonneville and Jessica Hynes of Downton Abbey and WIA fame; explorer and travel writer Benedict Allen; tap-dancing comedian and nutter Buddy of Wild Rides; Penny Farthing hero Joff Summerfield; Shane Winser from the RGS; Duncan Milligan and CJ of Tour de Force; Paddy Tyson and Nich Brown of Overland Magazine; Ingrid Turner from MAG; my editor Jennifer Barclay, Dean Chant and Stephen Brownlee from my publisher Summersdale and my wonderful boyfriend Marley. Fun was had by all and the dregs of us were shooed out to the local pub long after we should have left. To see a selection of photos from the evening click here and below is a little video filmed and edited by Charlotte Armitage. Huge thanks to Tommy Williams and Charlotte for taking the snaps and video. Next up was Norwich, England’s first UNESCO City of Literature and home to the Bookhive, a bombastic bastion of independence in a literary landscape all too dominated by that online bookstore. Henry Layte, the charismatic and brilliant founder of the Bookhive, gave an excellent talk, after which I gave a brief reading whilst my four year-old nephew tried his best to distract me by growling like a T-Rex. Sixty of us crammed into the Bookhive and I’m thrilled to say that both books and Boxer Gin ran out, with my mother doing a brisk re-sell trade of the multiple copies she’d purchased. The final stop on the tour was Stanfords in Bristol, where another eighty folk rubbed shoulders on the ground floor and drank us dry of the juniper nectar. I’m told that A Short Ride… now sits happily on the Stanfords best-seller list. Hooray. As well as the parties there’s been a fair bit of press for the book. I talked Honda Cubs and leathers on Radio 4’s Saturday Live with Fern Britton and Revd Richard Coles; had a rather Alan Partridge experience on BBC Radio Norfolk and discussed the virtues of having Hunter S Thompson and Ghenghis Khan as dinner party guests with Dr Phil Hammond on BBC Radio Bristol. There have been good reviews in Wanderlust and Conde Naste Traveller (with more to come in a number of women’s, biker and travel magazines). Other confirmed upcoming reviews, extracts, features and guest blogs are in: Overland Journal (USA, out May 13), Overland magazine (Summer issue), Wanderlust (mid-May), Adventure Biker magazine, Motorcycle Monthly, Bristol Magazine, Me and my Big Mouth, and the EIA. Now for some plotting and planning as to the next two (or three) wheeled escapade…..
Next PostSo you want to be a travel writer?